Northern New Hampshire is always guaranteed to be replete with snow during the winter months–the gold of skiing treasure hunters everywhere! The Great North Woods provides exemplary skiing, superb dining, and luxurious lodging at Grand Resort Hotels. Well worth the drive to northern New Hampshire. What better way to see New Hampshire’s mountains then from the peaks of such ski areas as Loon Mountain, Bretton Woods, King Pine, or Wild Cat? With 20 ski resorts, New Hampshire is an excellent choice for your New England ski ski vacation. 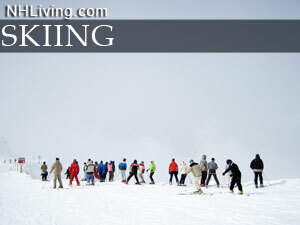 Visit every New Hampshire Ski Area and Ski Resort right here in the New Hampshire Ski Guide from NH Living. For the best skiing in NH, ski and snowboard conditions, trail information and ski area events by clicking on the names below or use the map below to find NH ski areas and ski resorts by region. Ask us about NH Ski Resorts or share your NH ski area comments. To feature your business, contact us.